Each tablet contains 5 mg of Warfarin Sodium USP. 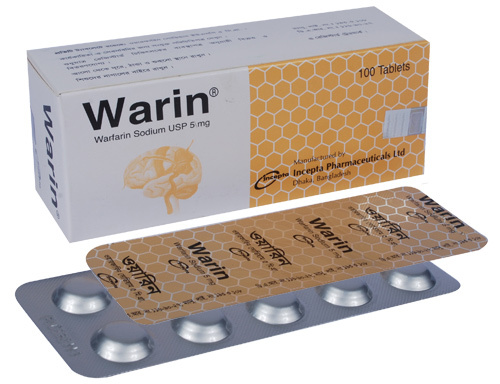 Warin is an anticoagulant that acts by inhibiting the synthesis of vitamin K dependent clotting factors, which include Factors II, VII, IX and X. Anticoagulant effect generally occurs within 24 hours after drug administration. This reaches a maximum in 36 - 48 hours and is maintained for 48 hours or more after administration is stopped. Whenever possible, the baseline prothrombin time should be determined but the initial dose should not be delayed whilst awaiting the result. The usual adult induction dose of warfarin is 10 mg daily for 2 days. The subsequent maintenance dose depends upon the prothrombin time, reported as INR (international normalized ratio). The daily maintenance dose of warfarin is usually 3 to 9 mg (taken at the same time each day). The maintenance dose is omitted if the prothrombin time is excessively prolonged. Once the maintenance dose is established in the therapeutic range, it is rarely necessary to alter. In emergencies, anticoagulant therapy should be initiated with heparin and warfarin together. Where there is less urgency, as in patients disposed to or at special risk of thromboembolism, anticoagulant therapy may be initiated with warfarin alone. Control tests must be made at regular intervals and maintenance dosage further adjusted according to the results obtained. Safety and efficacy in children <18 years old have not been established. However, there is evidence of use and the initial dose is usually 0.1 mg.kg-1.d-1 adjusted subsequently to aim for an INR range the same as in adults. Hemorrhage is the principal adverse effect of oral anticoagulants. Other adverse reactions include nausea, vomiting, diarrhea, hypersensitivity, rash, alopecia, and unexplained drop in haematocrit, "purple toes", skin necrosis, jaundice, and hepatic dysfunction. Periodic determination of prothrombin time (PT)/international normalized ratio (INR) or other suitable coagulation test is essential. Numerous factors, alone or in combination, including travel, changes in diet, environment, physical state and medication may influence response of the patient to anticoagulants. It is generally good practice to monitor the patient's response with additional PT/INR determination in the period immediately after discharge from the hospital, and whenever other medications are initiated, discontinued or taken irregularly. The following factors may exaggerate the effects of warfarin and necessitate a reduction in dosage; loss of weight, elderly subject, acute illness, deficient renal function, decreased dietary intake of vitamin K, administration of certain drugs (see drug interaction). Factors which may call for an increase in maintenance dosage include weight gain, diarrhea and vomiting, increased intake of vitamin K, fats and oils, and the administration of certain drugs (see drug interaction). Careful additional laboratory control is necessary if the patient is to be changed from one formulation to another. Reversal of warfarin anticoagulation by vitamin K takes several days. In emergency situations fresh frozen plasma should be given. Warfarin is contraindicated in the first trimester of pregnancy because of the risk of teratogenicity. It should not be used in women who are or may become pregnant because the drug passes through the placental barrier and may cause fatal hemorrhage to the fetus. Warfarin appears in the milk of nursing mothers in an inactive form. Infants nursed by mothers treated with Warfarin had no change in prothrombin times. Effects in premature infants have not been evaluated.